The creator of Fireman Sam has said he "can't see" how the children's show has a stereotype problem and puts women off joining the service. It comes after senior fire officer Alex Johnson told the Daily Telegraph "most of the job is nothing like it is portrayed" in the show. 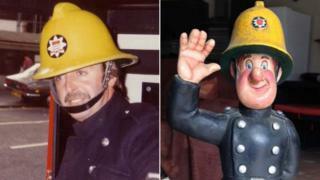 Ex-firefighter Mr Jones, 74, began working on the idea for Fireman Sam - Sam Tan in Welsh - in the 1980s after he heard Mike Young on BBC Radio 2 talking about his cartoon project SuperTed. "It is for children. It wasn't meant to be advertised as a recruiting post," he said. Ms Johnson, temporary deputy chief fire officer for South Yorkshire Fire and Rescue Service - who is campaigning to attract more women into the fire service - said that women and people from different backgrounds do not consider the role because "they aren't seeing themselves represented". Meanwhile, the London Fire Brigade, using #FirefightingSexism in its campaign, tweeted that the involvement of Penny Morris, a firefighting character in Fireman Sam, was "devalued". Mr Jones maintains there is "nothing he would change about" the show and said that in his 14 years as a firefighter, rushing into buildings on fire was "part of the job". "A fireman is someone who runs into fire or towards danger when other people run away," he said. "There has been no harm done from Fireman Sam, it has only done good and I am very proud to have created it."